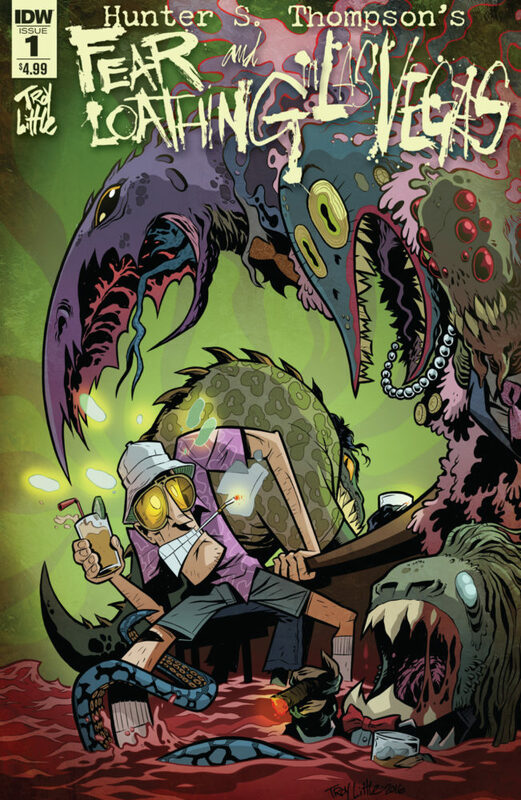 The Fellowship was fortunate enough to obtain a copy of FEAR AND LOATHING IN LAS VEGAS #1 from IDW Publishing. Troy Little adapts the Hunter S. Thompson novel. Journalist Raoul Duke is assigned to cover The Mint 400, an off-road race in Las Vegas. And like any good journalist, he consults his attorney and together they decide that this is the perfect opportunity for a drug-fueled adventure of epic proportions. As one does. This issue ends with the boys checking in at the event to get their press credentials. Race officials get a mere taste of what they’re in for. It would be pure folly for this reviewer to comment on Thompson’s iconic story. Little’s adaptation, though, does a lovely job of capturing the madness. It’s often a difficult story to tell, and Little’s efforts at showing us Raoul’s hallucinatory point of view are quite effective. It’s as much about how he distorts the “normal” images as how he represents the actual hallucinations. And it all warps together to great effect. All I can say about this story is that it’s a story that needed to be made as a comic book. Between that and the back material (which I won’t spoil), you need to get this book. FEAR AND LOATHING IN LAS VEGAS #1 is available now at your FLCS or at idwpublishing.com.